Like Sasha Banks, Njideka Akunyili Crosby makes work that questions the apparently immovable notions of nation and history. As a Nigerian immigrant to the United States, she explores the interconnected web of nations she comes from - Nigeria, with its complex British colonial history, and the United States, with its attempt at a more invisible global empire. Overlaying different media elements and references pointing to distinct continents and historic moments, she collapses borders meant to be understood as inviolable, and in so doing she shows the architecture, the artifice underlying those borders. As da Silva describes the work of the Black Feminist Poet, from borders and categories Akunyili Crosby makes, or shows, connections. In an interview with W Magazine Akunyili Crosby explains, “I wanted to put out pictures of these parts of Nigeria that I knew and experienced. People forget that life exists in these places. There are serious things that are wrong in the country, but people exist and thrive. We hang out. We get married. We talk as a family. We lie in bed together. I can’t make this point enough. It’s hard to think people matter if you don’t feel connected to them. And so it’s about making that connection.” This is not a matter of proving one’s worthiness to the label “human,” but instead again a declaration of life and existence beyond the narrow view of life and the world proposed by a white supremacist patriarchy the Black Feminist Poet works against. I am grateful for and amazed by the intimacy of her work, the window she makes for us into a personal universe. I particularly love her series “The Beautyful Ones” (Figure 1) and “Predecessors” (Figure 2). In the former she paints herself at various ages, providing for us the kind of simultaneity and becoming da Silva describes, while also uplifting the joy and power and value of Black girlhood. In these paintings, a young Akunyili Crosby gazes directly out from the canvas, confident and brave, offering us hope from the perspective of this child’s promise fulfilled. The little girl in these pictures won a MacArthur Genius grant. Of course, awards from prestigious institutions do not measure value, but nevertheless the question is raised -- what incredible things will the little Black girls in your own life do? How can you ensure they are able to? How can you stop the world from stopping them? Lorde, Audre. "Poetry Is Not A Luxury." Sister Outsider. 1984. Crossing Press, 2007. Solway, Diane. 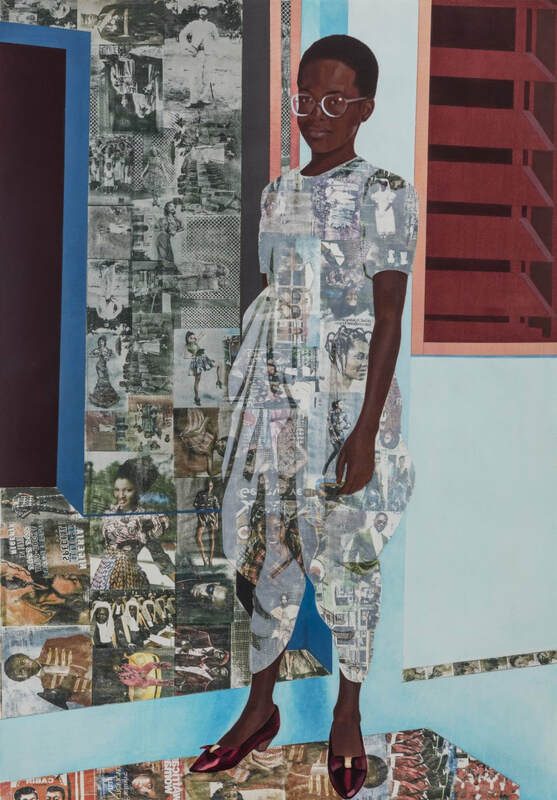 "Nigerian Artist Njideka Akunyili Crosby Is Painting the Afropolitan Story in America." W Magazine, https://www.wmagazine.com/story/njideka-akunyili-crosby-artist-painter. Accessed December 2017.